It may have snowed eight more inches yesterday, but it is spring inside with the delivery of our new quilt. Janice worked feverishly to get the quilting done and back to me for the photographs, so without further delay we present: GLAD ALL OVER. You just can't help but smile when you see this quilt. We used Moda's new fabric line from designer MoMo, called WONDERLAND which delivers into stores this week. 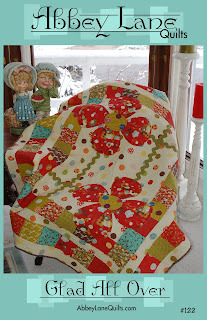 It can be made with 77 of your favorite charm squares ( 5" squares) and a background fabric. We feel you just can't go wrong with Ric Rac. Just a hint. We sew it on by machine, outlining both sides, then put in on the quilt machine. This quilt is fun, fast, and really easy. Choose your favorite method for appliqueing the giant flower petals. I put these on by hand, my favorite method. Janice did a great job on the quilting for these flowers. Check it out. This pattern is available for purchase on the website http://www.abbeylanequilts.com/ or give us a call 407-687-8848. 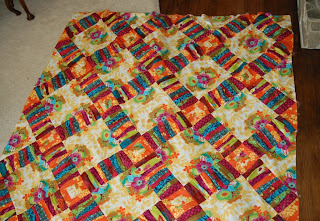 Next is an update on the quilt made from the Anna Maria Horner Fabric. I sewed it together, then didn't like it, so I unpicked the entire thing and put the pieces back to gether a different way. Now I love it. Janice has it and has started the quilting. There are some really fun techniques used in this quilt and we will tell you more about it when the pattern is done, another week or so. We would love your comments and suggestions, so let us know what you think. Have a great week. p.s. if you click on the individual pictures, they will blow up bigger, much easier to see the details. I LOVE Glad All Over. Just got your email newsletter and I was going to write and find our what fabric line you used. This is a must have pattern! You guys are amazing!!! 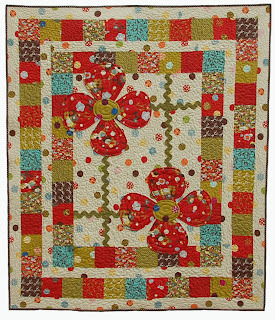 I'm loving all the colours you have used in the quilts - both of them are fabulous. Thanks for sharing. It's Lisa (Janice's neice). Just checking out your blog. I love your new quilt "Glad all over". It's really cute! You two are so talented! I'm going to have to make me one of your abby bags. Great idea. I've been taping a ziploc bag to my table, but your idea is much cuter! Congrats on getting married Marcea. You looked beautiful! Hey Janice and Marcea! I love your quilts, they are so beautiful! Janice, Kevy has your CD of his wedding. I just mailed them over to him, so hopefully he'll mail it to you quick! Love you!